Home / What Can You Do About Dog Paw Injuries? What Can You Do About Dog Paw Injuries? Dog paw pads look tough but in reality, dog paw injuries are a common occurrence at the vet’s office. It’s no wonder really, sharp rocks, sticks and maybe even glass litter the ground. Throw in steaming hot pavement in the summer or freezing temperatures in the winter and it’s amazing our dogs don’t suffer from more dog paw injuries. 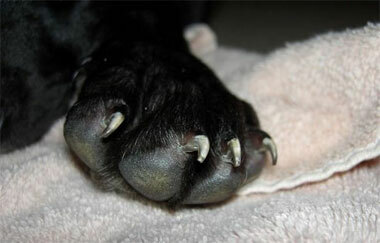 Paw injuries can vary from cuts, chemical burns or something lodged deep between the paw pads. The paw pad is full of nooks and crannies where pebbles or spiky plant material get lodged and make it hurt to walk. You’ll often notice a paw injury because your pet starts limping or chewing on the hurt foot. Maybe your dog even cries out when she puts pressure on the foot. If your pet pulls her foot back when you try to look at it, you can bet there’s a problem. Try to get a good luck at your pet’s foot. Is there blood or another visible sign of damage? Did you see anything happen that would cause you to think your pet had a sprain, bruise or even a broken foot? If it’s a minor issue like brushing ice crystals from between your pet’s paws then a simple “paw bath” may work. If you have a more serious issue like a deep cut you’ll need to get your pet to the vet right away. She could need stitches. Open wounds are also breeding grounds for infection that can cause other problems. If you take your pet to the vet with a paw pad cut, chances are the veterinarian will clean it and wrap it in a clean bandage. If you’ve ever had this happen, you know your dog isn’t going to leave that bandage alone. She’s going to start licking it and chewing on it and maybe tear off the bandage and re open the wound. You have the option for an Elizabethan collar. (Your dog will put on her most pitiful expression.) Or you can use dog socks to cover up the hurt foot. When you use socks to cover the wound, the extra layer makes it more difficult for your dog to take it off. You can ensure the socks stay on and protect the bandage with the Snuggy Boots Suspender System. The suspenders clip to the collar and to the socks to hold them in place. Better yet, protect those paws all the time with dog boots when going for walks. Dog boots protect in both warm and cold climates. After all, if you live in a hot climate and walk your dog on cement or hot sand, it can burn your pet’s paw pads. Think of yourself barefoot on hot sand or blacktop. It’s scalding! Protect those little feet with dog boots and keep the dog boots in place with The Snuggy Boots Suspender System. Whether hiking in the woods or walking in town, you don’t have to worry about dog paw pad injuries and the accompanying expense and concern.